I am still here – just extraordinarily busy in Real Life. The Azbel is also still here, or there, in space. It forces me to log in at least once a day to check for War Declarations. That, if I am to be entirely honest, can be a touch irritating. It can be refreshing not to log into EVE for a day or three, and a chore when you feel you are being forced too. The vague justification for anchoring the Azbel was to allow me to flesh out and fully research my BPO Collection. I have been accumulating BPO for more than a decade and had more than 850 of them. I might justify them as part preparedness, part self-sufficiency, but mostly it is OCD. I carefully went through my entire collection, looking for any that were not fully researched, and for any I was missing. This took quite an effort. I currently have 885 BPO, all fully researched or in the process of getting there. There are a further 64 I must fly around and purchase. It is not exciting but has me undocked. Some of my BPO are for POS and their modules, which CCP are working towards withdrawing from the game. I presume I will get those taken off me and reimbursed at some point this year. There were a lot of BPO I do not plan to buy due to cost. I was able to comfortably buy all the BPO I needed to build and fit a couple variants of small POS. The price of Structure related BPO however is substantially higher – to the point it seems unlikely most casual players could ever be able to justify buying them for their own use. CCP seems to have priced them for Null Sec players and corporations who are fat on the teat of anomaly Supercarriers and belt Rorquals. I wish there was a level down in the structure tree – the equivalent of small POS – for the less wealthy players. I don’t feel I will see that unfortunately. He is currently working on Marauders V. This latest training is more for bragging rights than anything else. I still haven’t used the SP he purchased. I am not sure what way to go with that. What else have I been up too.. I have finished stockpiling ships to be able to mount a defense if my Structures are attacked. I will only throw these away if it is viable that I will get something worthwhile out of the experience. 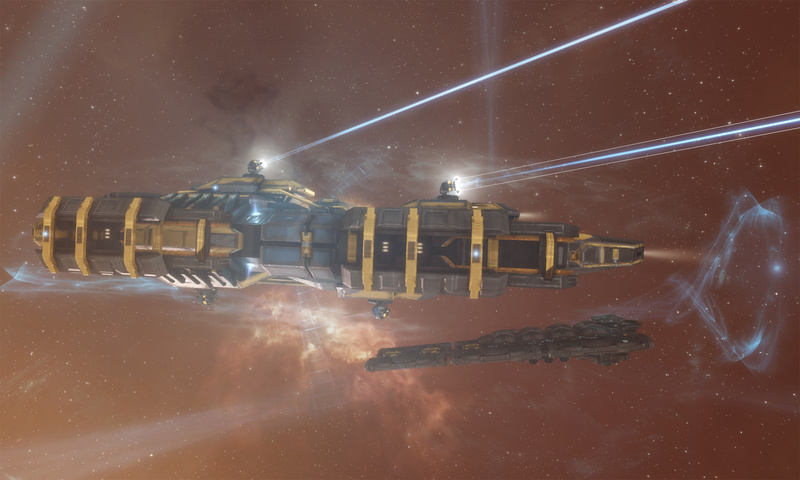 I have been playing around with dual box mining again – first with a boosting Porpoise, then a boosting Orca. They drone mine a reasonable amount by themselves and give an impressive helping hand to the second account. From memory the Strip Miner range went from 15 to 27km, and the extraction cycle dropped from 167 to 112 seconds. There is still a little room to move there to improve. I put that on hold however as one of the locals came under War Declaration and I did not want to parade myself around as a suitable next target for the attackers. Last of all the Astrahus build continues – but I’ve missed weeks of PI cycles due to busyness. I’ve gathered above 76% of the total P1 requirements. I think we all know the feeling when you have to log in, and not really being in the mood for it. Btw I have recently returned to your blog and eve, and was trying to find the fittings you used when you went around and explored. I seem to remember you had a fitting section, but can’t find it anywhere. I also tried looking at the “fitting” sections but no luck. Can you perhaps show me the where to find it? Or you are welcome to ask, and I will provide whatever the latest fit is I am using. Thx alot. Yes i guess I could just ask. But I couldn’t really find a good way to do it. Anyway I’m inspired by the way you lived in eve with the orca and everything, and I’m trying to figure out if that could be something close to what I would like to do. Just not really that good with fitting ships be it a good explore ship or the transport/home ship. That’s why I was looking for it. You are welcome to Eve-mail Elmis in game. I can answer questions there / send fits. I still like the Orca roaming home base (and am in the process of fitting up another one), but the problem is being ganked. Even if you don’t end up carrying much in total value – a collection of ships, spares and loot can make it look like you are worth ganking. For Hi-Sec Orca roaming I now carry a T3 Destroyer for PVE sites, a Covert Ops or Astero for Data/Relic sites, and some sort of T1 mining ship – to keep values down.